The Iranian New Year, Nowruz, is one of the most important celebrations in Iran. It has its origins in the Zoroastrian era and the ancient Persian dynasties. In harmony with the rebirth of nature, Nowruz always begins on the first day of spring. 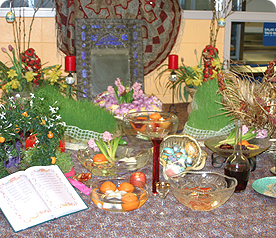 Nowruz ceremonies are symbolic representations of two ancient concepts, the end and the rebirth. A few weeks before Nowruz, Iranians clean and rearrange their homes. They make or purchase new cloths, bake pastries and germinate seeds as the symbol of renewal. On the first day of spring, the ceremonial cloth is set up in each household. This decorated ceremonial table, which is called “Haft Seen” includes seven traditional items the names of which in Persian, begin with “Seen س- “ or the letter “S”. The common thread among these seven items is that they all grow from earth. In addition to these traditional items, the table may also be decorated with candles, colored eggs, sweets, goldfish in a bowl, coin, as symbol of wealth, and hyacinth flower, as symbol of nature and fragrance.The period of Nowruz festivities extends for two weeks. Its end is marked by celebration of the thirteenth day (Si’zdeh) of the New Year. This is a public holiday, and on that day families traditionally take their samovars and rugs out into the countryside and enjoy a picnic.